Enjoy our beautiful riverside picnic grounds offering 2 areas available for picnic rental. Our picnic areas are perfect for family or group reunions, work picnics, corporate and team building outings, graduation parties, or just have a party! Any size group from 3 to 300 or more! No bands or amplified music of any kind. Our large picnic area includes 2 pavilions, big fire-pit, volleyball court, horse shoe pits, playing field, large BBQ pit and electric power. 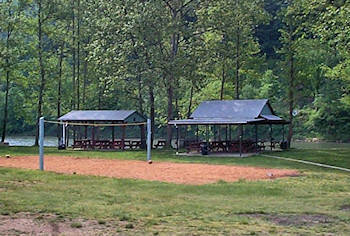 Our small picnic area includes 1 pavilion, BBQ grill, and other amenities as they are available. Reservation and deposit required. There is a 10% discount on rental equipment for groups of 10 people or more. Check out our second location at Laurel Hill State Park Lake! & River Safety Rules Read important safety information. Save time by printing, reading, and signing the required Waiver and Release of Liability Form before you arrive. Dawson River House Rental Have you ever slept in a 199 year old house? Well now you can! Located right on the river front! Watch Our Promo	Video Watch a short video to see a little bit of what we're all about starring Hazelbaker's! Want a great job this summer? Print out the form, complete it and return it to Hazelbaker's at once! 8am, 10am and noon. Reservations Required! Open 7 days a week 10am until 5pm. Last rentals at 5pm, return by 6pm. Copyright © 2008 - 2019 Hazelbaker's Bottom Yough Outfitters, Inc. All rights reserved.